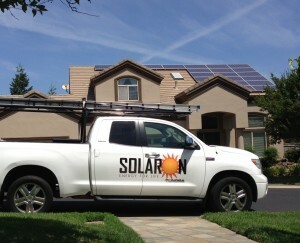 For a quality solar energy contractor in Sonoma, you should go with Solaron! An Authorized Dealer for SunPower, our noteworthy relationship with this business giant provides us with photovoltaic panels that are ahead of the competitors in efficiency and durability. And with the experience of more than four thousand installations behind us, Solaron has the experience with designing, making and constructing solar systems that you need in a solar energy contractor. If you’ve decided that solar energy is right for you, it’s time to locate a contractor in Sonoma that can match your vision for efficiency and quality. Solaron is that contractor! Spare the air, save money, and be a part of the movement to change the future of our planet. Solar energy brings benefits both environmental and monetary. Learn more from a Solaron sales technician! Turn up the temperature with solar pool heating! Solar rays already warm your pool in summer, but a heating system from Heliocoil makes sunshine work even in the colder temperatures of spring and fall. Have the warmth you want, when you want, for longer throughout the year. This enhances the health and entertainment value of your swimming pool investment.